Book Review: Christina Thompson's 'Sea People' Examines The Origins Of Polynesia Christina Thompson deftly weaves her fascinating narrative of European travels and attempts to understand the Polynesian puzzle in her new book, though European colonization is not fully addressed. Humans are curious creatures, seekers of new lands and new knowledge. But the results of our shared explorations have often been destructive. The first people to arrive and settle in the many islands that lay in the middle of the Pacific Ocean — the largest watery basin on earth — were certainly harmful to the ecology of those places, where species of both flora and fauna went extinct quite quickly after human settlement. Worse, however, is the destruction wrought, both purposefully and accidentally, by the arrival of humans to already peopled lands. Sea People: The Puzzle of Polynesia by Harvard Review editor Christina Thompson, however, treads lightly on this theme, preferring instead to dwell in the optimistic and romantic idea of cultures meeting and melding. Thompson admits in the prologue that "the story of the Polynesian settlement of the Pacific is not so much a story about what happened as a story about how we know." 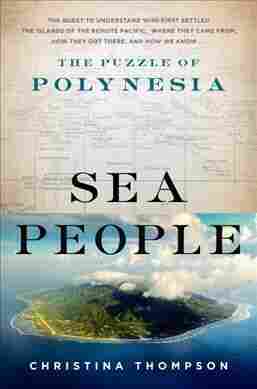 Indeed, as a tracing of Western epistemology, of the ways we have collected knowledge and made meaning out of it, Sea People is a roaring success that addresses observer bias, different ways of understanding knowledge and relating to the natural world, and the covert and overt racism that colored many strains of research and thought surrounding Polynesia. The book moves chronologically from the point of Portuguese navigator Ferdinand Magellan's voyage, which was the first European attempt to travel successfully into the Polynesian Triangle, a vast section of the Pacific Ocean — more than 800,000 square miles — and the subsequent contact with the inhabited group of islands known as the Marquesas by the Spanish Álvaro de Mendaña. Thompson is careful to write that "the claim that any European explorer discovered anything in the Pacific — least of all the islands of Polynesia — is obviously problematic," seeing as the islands that could be inhabited already were, and had been for at least hundreds of years, perhaps thousands. Still, and unfortunately, the book's very structure supports the hegemony of European knowledge-making, discovery, and ways of thinking. Thompson is certainly an engaging writer, deftly weaving her fascinating narrative of European travels and the newcomers' attempts to understand and "crack" the Polynesian puzzle: Who are the occupants of the Polynesian Triangle descended from? Where did they begin their journey off a mainland continent and into the dangerous ocean? How were they capable of this — and why did they do it in the first place? There is much to be fascinated with in these pages, like the question of how a prehistoric people without metal tools, who stitched together their boats with wood and plant-based fabrics, traveled to and between islands in the first place — to the ways in which their dispersal throughout the region meant that there are still genetic, cultural, and linguistic links between peoples as far apart as New Zealand and Hawai'i. But issues of European colonization are often glossed over, so that, for instance, halfway through the book, we suddenly discover that "the practice of tattooing [in the Marquesas] had been outlawed by the French government in the late nineteenth century." Up until that point, as a reader previously quite ignorant of the region's history, I hadn't been certain whether the European arrivals of centuries before had become actual colonies or had merely settled in among the locals. Such eliding is perhaps a matter of length and focus, as well as a decision to move chronologically from the European perspective, but it's a shame that it isn't until the third part of the book (titled somewhat glibly "Why Not Just Ask Them?") that Thompson begins to deeply explore the various Polynesian oral traditions that relate (often in tandem) genealogies, histories, myths, navigational lessons and practical skills and which have, in most recent scientific discovers, proved to be quite accurate in terms of timeline and historical voyaging. It's true that such oral tradition might have been lost without various European scholars — including, to be fair, many who had a deep respect for and appreciation of the cultures they were allowed a glimpse into — but, of course, there would have been no concern for losing these if European settlers hadn't brought with them disease that the locals weren't immunized to and a sense of hegemony that allowed them to claim the populated lands they "discovered." Still, Sea People is undoubtedly a deeply interesting read, and at points incredibly moving. One such moment is her account of the Hōkūleʻa, a vessel that set sail from Maui to Tahiti in 1976 that was attempting to prove that it was possible to navigate from Hawai'i to Tahiti and back without Western navigational instruments. It was in response to increased skepticism among Western experts that the first Polynesian settlers got anywhere on purpose. Since there were no navigators in Hawai'i who still remembered the old ways, the expedition hired Caroline Islands navigator Pius Piailug, known as Mau, who had learned traditional navigation techniques (still barely understood by Western thinkers) at his grandfather's knee. Mau not only proved that it was indeed possible to navigate using the stars and sun and the reading of ocean swells (not the same as waves), but that these techniques could be taught; Mau taught a Hawaiian man, Nainoa Thompson, who taught others. The knowledge, so close to being lost through Westernization, lives on.